This is how the kitchen looked the night before Kevin came to start the remodel. We stayed up late packing everything away. First of all, I love my house and I love my kitchen. However, my husband was not pleased with the way the kitchen has been holding up (or, “falling apart”) since we moved to this house seven years ago. The cupboards were cracking, some of the doors had already fallen off and he reglued them. Some of the drawers were missing “stops” so every once in a while someone would pull a drawer completely out, making a big mess. One of the bigger drawers was stuck shut and no amount of pulling could open it. 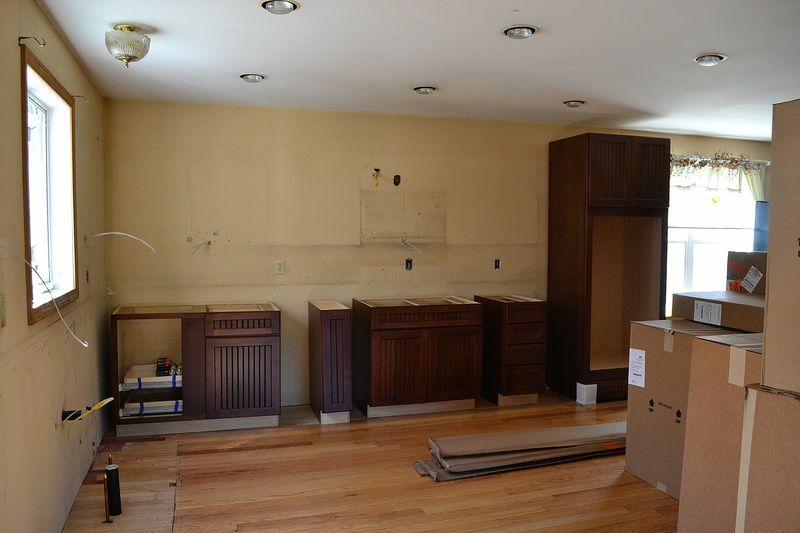 While I am not partial to change OR major projects, Rich decided it was time to replace the cupboards and remodel. He has been the driving force behind this whole experience and I am so thankful that he cares to invest in our “nest”. We have the finances to do it and are thankful for no borrowing or debt. Secondly, this is part one of two major projects. After the kitchen is done, we are also planning on doing an addition off our current dining table area to a new dining room/corner office/big pantry. The plans are all drawn up and we hope to get that started in a few weeks. Rich and I have been making the decisions for the kitchen together, and it’s been fun. We both loved the look of dark wood for the cabinets, and we chose a nice solid cherry. We picked out a double oven, decided to put in a second dishwasher, and found a flat top range that is bigger than what we had. I look forward to cooking many meals (and I may even look forward to cleaning up!) for our big family over the years with a lot more ease in our new kitchen set-up. At the same time, I feel extremely humbled, and frequently tear up, because really, there is no need for such luxury. I take it as a gift of love from my husband, which is what it is. Having Kevin working in the house every day was awkward at first but we quickly got used to him, he’s a very nice man and is so patient with us, with Seth especially. Dear Seth is very inspired and now considers himself A Builder, too. He wants to help, he wants to participate. I have to work on keeping him out from under foot. I appreciate that Kevin is a neat worker, always sweeping and vacuuming up after himself. This is what the kitchen looked like after day 1. He removed all the cupboards and the half wall. (there is a big dumpster sitting in the driveway outside) I was thankful to be able to use the sink, oven, and dishwasher for one more day. 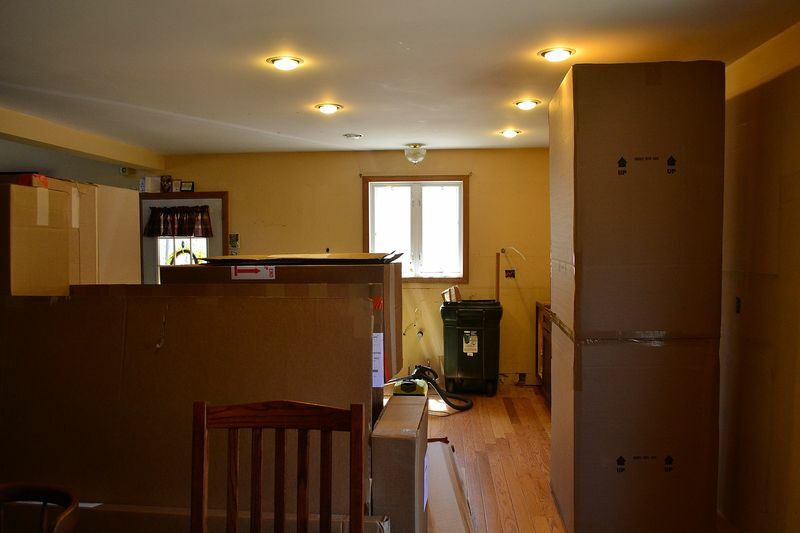 On the next day, the kitchen and livingroom were filled with boxes of cabinetry. This was very exciting for the kids. See that very narrow piece in sort of the middle? *SPICE DRAWER! * I’m just thrilled as I have wasted so much time in the past, digging around searching for a particular spice for recipes. I plan on organizing them alphabetically. The lower cabinets all have pull out shelves. 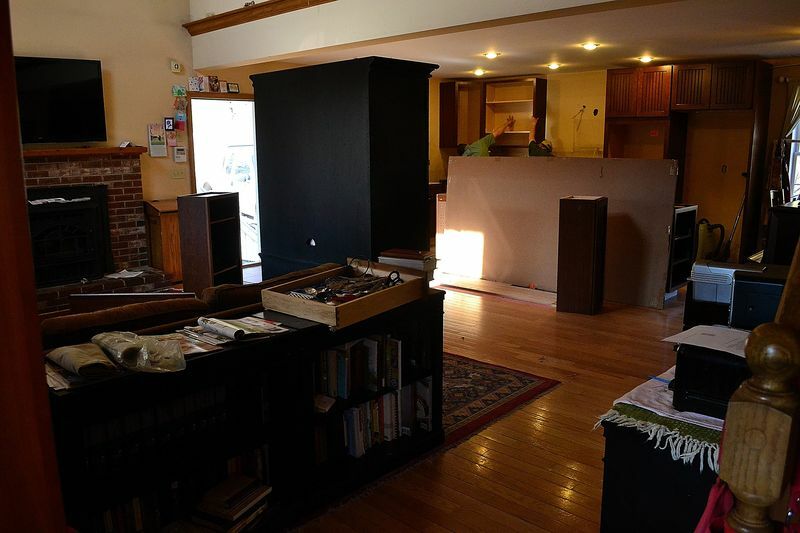 As you can see, the black stand is moved into the middle of the livingroom. This is so the electrician can place the cords of the tv behind the wall. Yes, we are also having other little house projects done at the same time, including a full paint job in the livingroom and kitchen. The silverware is in the livingroom, along with the coffee maker and some dishes. The master bedroom is full of groceries, kitchen linens, small appliances, and dishes. I love love love the cabinetry! I keep going out to open and shut the doors. (the doors shut silently! You let go half way and it slowly shuts on it’s own) And I love that we no longer have that half wall anymore. Instead, we have a long island. We chose a wood top for it, and granite for the counters. We will fit four stools at the island. Ethan said it will be like a restaurant. After the new addition is done, the table will no longer be in the room. I requested bookshelves at the end for my cookbooks. I started moving them into place! The table and bathroom have become my temporary kitchen. I laugh as I wash up the dishes in the bathroom sink. I dump the leftover milky cheerios into the toilet and flush ’em down, then scrub everything up in the itty bitty sink. I have the crock pot out and have made soup and hot dogs. I also heated up leftovers in it. Crock pots are so handy! I have the toaster ready and available on a bench by the table, too. With no oven for the last week, we have been eating lots of deli food (macaroni salad, potato salad), sandwiches, and fruits. The children have cold cereal and toast each morning for breakfast. Dinners are a little harder because they are so used to my good hot meals (LOL). It’s been mainly sandwiches, but we did order pizza last night, to Ethan’s great delight. Washing the crock pot insert in the bathroom sink. So weird, that I had to take a picture. Tomorrow the oven will be set up and the cords to the TV will be in place so I can move that crazy black stand back into place. Kevin also plans on putting up the crown molding along the top of the cabinets, too. Things are a little topsy turvy here– and there are definitely moments when I pull my hair out (so to speak) but it has gone well so far. I am managing a household of nine, with five school children, two of which are in sports, and two preschoolers who are so very busy, but I will never complain, that’s for sure. This is a girl’s dream come true! I love my life. I dream of kitchens lately and I can’t wait to move into mine! This entry was posted in Uncategorized and tagged kitchen remodel by Shanda. Bookmark the permalink. I love my kitchen. The cabinets were made by an Amishman. I also have shelves that pull out, and the drawers that go back by themselves. I was fascinated by them at first. I had never seen them before. I have an old-fashioned breadboard, but no spice drawers. That sounds like a great idea. I have to admit, I’m jealous of your huge kitchen! And your new awesome cabinets! What fun for your family. You will LOVE it. So excited for you! Remodeling is fun. Especially the kitchen!My husband owns a construction company. He has built and remodeled more kitchens than I can even begin to count over the years….however, he hasn’t gotten around to his wife’s kitchen yet. 😉 I can’t complain, he has done so much work to our house, however, I still would love a new kitchen. Someday. 🙂 Your cabinets are BeAuTiFuL!!!!! Love the doors. They are so warm and cozy looking.You have so much space. 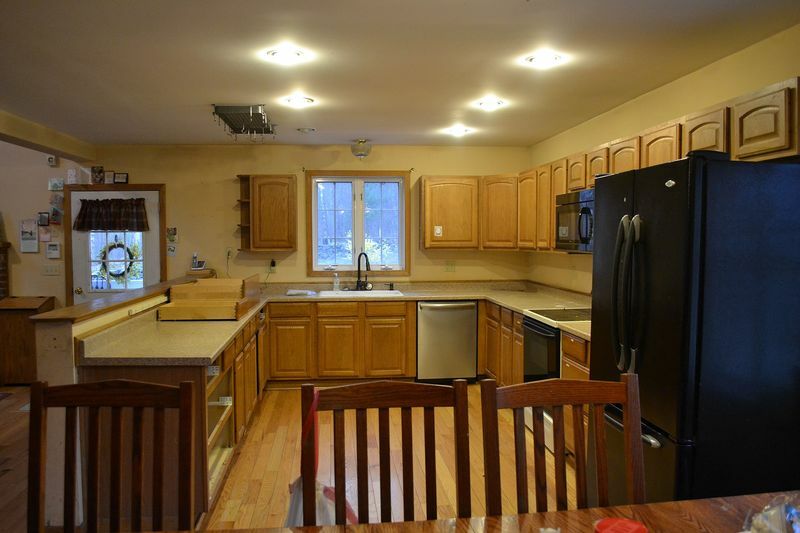 Perfect for your family!I can’t wait to see the next part in your Kitchen Remodel series! It’s like watching HGTV. :)Happy Tuesday. 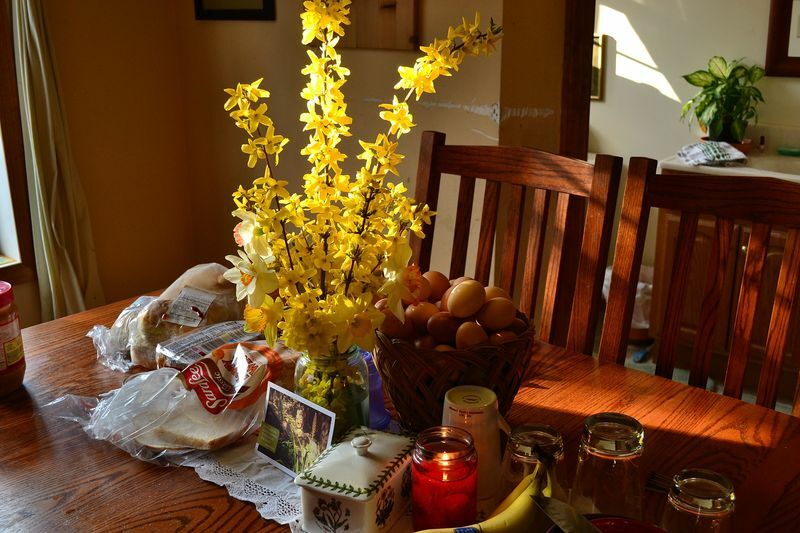 hi shanda…….your kitchen was always wonderful and a place of love and comfort for sure. but i must say, those dark cabinets sure warm up that space and look simply gorgeous!! can’t wait to see the finished product. it is a gift of love from your husband, indeed, and one that will continue giving as you make new memories and yummy meals over the years. so happy for you!! Very nice make-over of your kitchen! I’ve learned to cook almost anything on a propane grill and the burner of a turkey fryer ;)Make a fire out in your firepit and roast some hot dogs, fry some eggs on a pan over the fire or try toasting PB n J on the grill – yummy! There’s so many things you can cook over a fire. A big blessing to have such a cozy, warm home as yours! A haven of rest, comfort and joy. I remember when we redid our teeny tiny kitchen. It all went well until it was time to install the countertops. Something went wrong, and we ended up waiting almost 9 weeks for the contractor to get’r done, lol. As you know, no counter, no sink. It was an interesting time. You are going to have a beautiful and functional space when it’s all done. Nice. GRACE AND THE BAG——IT AIN’T FAIR GRACE IS TOO SWEET THAT HAD TO MAKE YOU REAL PROUD!!!!! It looks amazing!!! All the upside down living will have been well worth the wait for such a nice new kitchen!! Can’t wait to see the before next to the after pic! Lots of work and inposition but updates and new stuff is grand when completed! Good luck! Love the crock pot snap! Oh, how wonderful! It is going to be so much better for you! There is nothing like a few days of “living rough” to make you appreciate what you have. Sounds like you need to have omelets for dinner! Or make a huge bowl of egg salad! So nice that he’s keeping it neat while working! I am sure it’s making the process much easier for you. I LOVE IT!!! 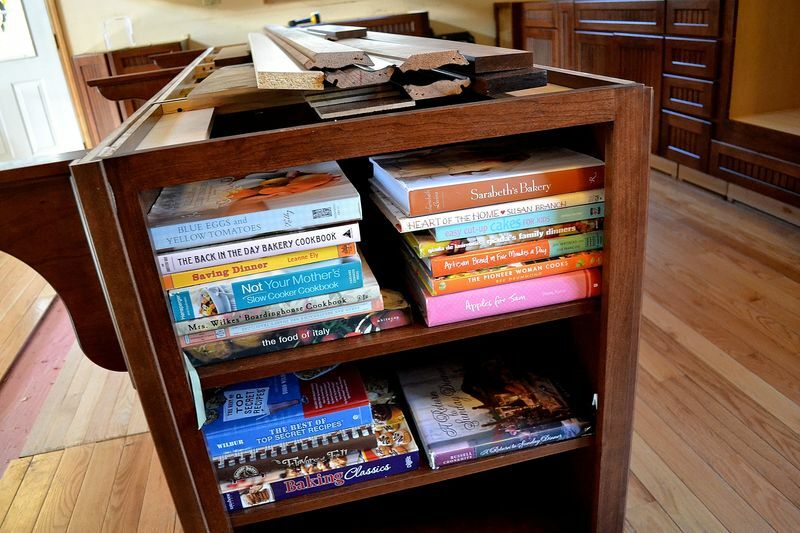 I absolutely LOVE the cabinets, and I like the idea of the bookshelf on the end of the island. (I might have to steal that idea! )Isn’t it so nice to have supportive husbands? My hubby is the one who is insisting that we have granite counter tops in our next kitchen. :)I’m so incredibly happy for you. 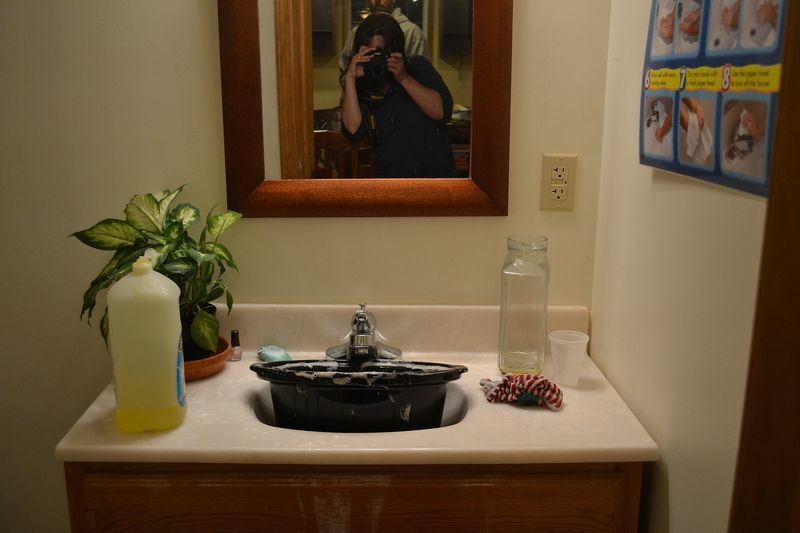 PS: You get the ‘woman of the year’ award for washing dishes in that small bathroom sink! LOL. Ps: can’t wait to see what adventures unfold in your brand new kitchen! Oh the baking you will do! We, too, are in the midst of a kitchen remodel and washing dishes in the bathroom sink! It is kinda of like camping and I am enjoying it! Looking forward to the end product….yours and mine! I love it! We had fun over here trying to think about what you were going to do. 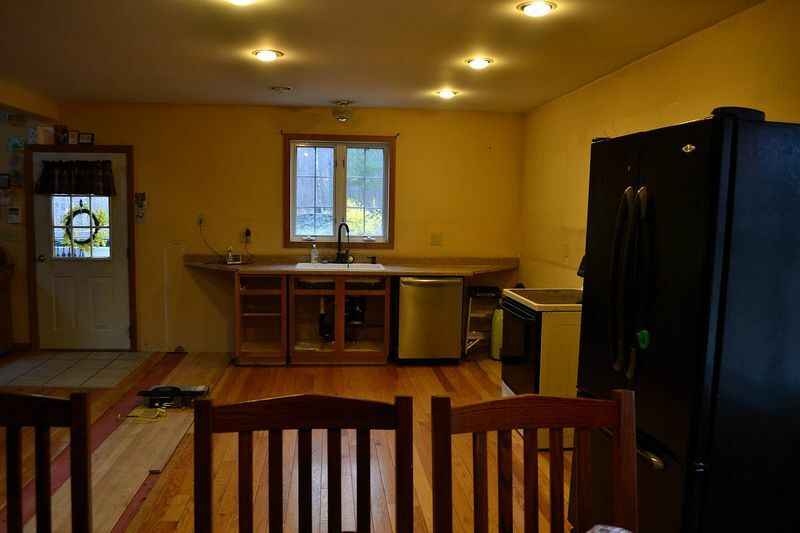 My woodworker hubby figured out that the cabinets were probably not holding up, and David and I imagined more seating, an island, and expanded dining area. I am with JO. So excited to see what has been done, and dying for more details Aren’t we funny? I love spice drawers, cherry wood, pull out shelves in cabinets, room for cookbooks, and big stove tops! What a great idea to have two dishwashers! I am excited for you! I think Seth needs a builder tool belt We did a remodel back when Dan and Nick were preschoolers…it took weeks! It was a combined job with a carpenter and Bob, and they were constructing the cabinets, so it didn’t go very fast. I think washing dishes in the bathroom sink was the hardest, so I relate. Love how Rich loves you. 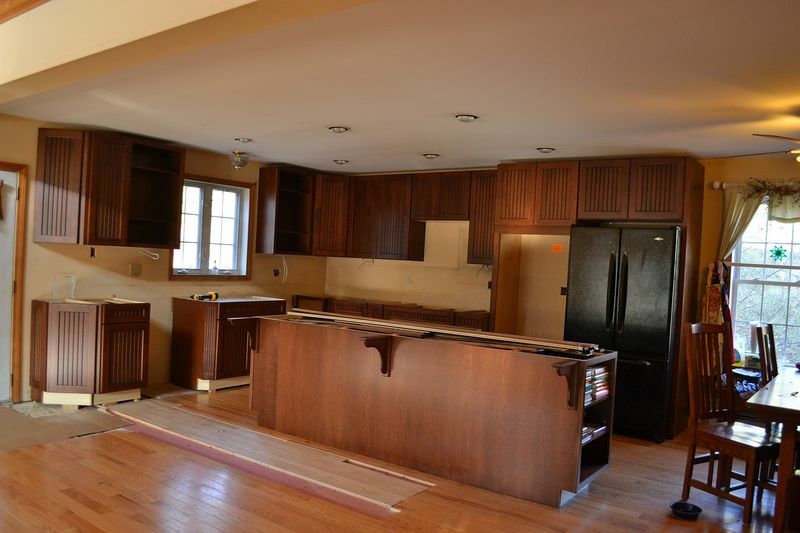 You will make many, many meals, and memories in your kitchen.I am guessing that you may have taken up some of the flooring where the new island is, and used that for the exposed area? Like Jo said, it did come to my mind! it’s going to be so nice, shanda. i love how you showed us the process – before, during.. and can’t wait till after! seems like kevin is getting it done fast. i thought it would be weeks and weeks, even months. 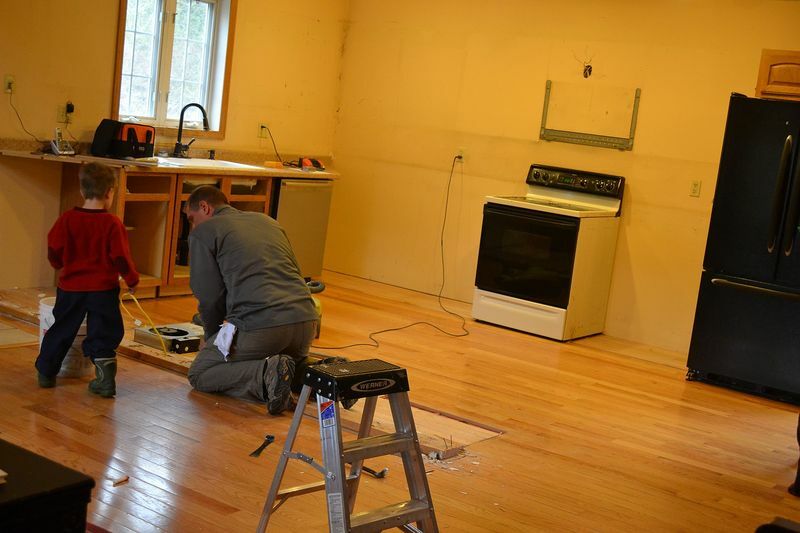 a kitchen reno just sounded so huge – but wow! in one week’s time it already looks almost finished. happy for you and sweet to have your man love on you that way! @connie – Thank you Connie! How’s the schooling going? Have the boys finished up yet? Have you made your plans for your summer trip yet? I’m loving the new kitchen. Can’t wait to get settled in it! Happy Friday! @Jo – Jo, the garbage is now hidden away in a cupboard, the bottom pulls out for two cans, one for recycling and one for trash. I’ll take a picture for next post. The floor got fixed yesterday! Thank you so much for the comment! I always always love hearing from you. @elissa326 – Great to hear from you on here, friend! Love you! SO exciting! Can’t wait to see the finished product! You are super mom, managing all that at once! Wow!